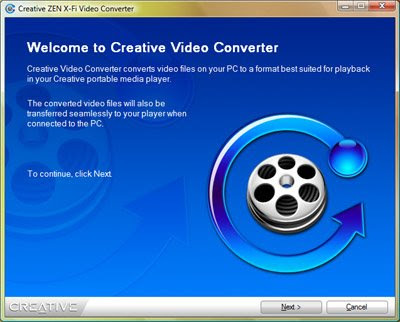 Creative finally came up with a video converter for the ZEN X-Fi. Previously, all videos have to be converted with the Creative Centrale and you have got no control on the video output. The Creative ZEN X-Fi Video Converter is basically the Creative Video Converter that was bundled with Creative previous players like the ZEN Vision & ZEN V series. It allows you to choose the output quality (Good, Optimum, Best) of the video and an option to crop your video to fit the screen resolution. I don't get any sound while converting from vob to avi / wmv using de creative ZEN converter? can i do something to improve s speed?? if not, could you recomend me another converter?